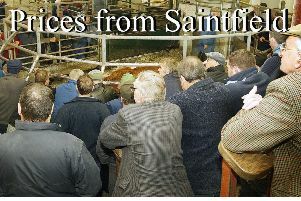 Another good turnout of stock at Wednesday’s sale with great prices throughout. Please ensure all cattle for fat ring in by 10.30am, sale starts at 11.00am. Leading prices: Crossgar producer Blonde d’Aquitaine 750kg, £170, £1,275, Belgian Blue 630kg, £166, £1,045, Donaghadee prodcucer Aberdeen Angus 610kg, £172, £1,049, Belgian Blue 640kg, £137, £876 and Newtownards producer Belgian Blue 530kg, £173, £916. BEEF BULLOCKS: Sold to a top of £1,228 for 690kg Belgian Blue £178. Leading prices: Donaghadee producer Belgian Blue 690kg, £178, £1,228, Aberdeen Angus 680kg, £174, £1,183, Aberdeen Angus 560kg, £187, £1,047, Comber producer Hereford 650kg, £184, £1,196, Saler 720kg, £166, £1,195, Simmental 680kg, £175, £1,190, Blonde d’Aquitaine 670kg, £172, £1,152, Belgian Blue 610kg, £186, £1,134, Belgian Blue 560kg, £186, £1,041, Limousin 550kg, £175, £962, Belgian Blue 560kg, £171, £957, Limousin 540kg, £176, £950 and Dromore producer Simmental 630kg, £187, £1,178, Aberdeen Angus 600kg, £195, £1,170, Limousin 560kg, £200, £1,120,. HEIFERS: Sold to a top of £1,045 for 490kg Limousin. Leading prices: Killinchy producer Limousin 490kg, £1,045, Aberdeen Angus 490kg, £910, Downpatrick producer Limousin 550kg, £985, Limousin 510kg, £975, Limousin 500kg, £920, Limousin 450kg, £810, Comber producer Limousin 550kg, £965, Simmental 410kg, £850, Ballynahinch producer Limousin 470kg, £920, Charolais 430kg, £870, Charolais 430kg, £830, Comber producer Charolais 370kg, £890, Limousin 470kg, £880, Lisburn producer Belgian Blue 480kg, £880, Belgian Blue 480kg, £850, Saintfield producer Charolais 370kg £835, Limousin 390kg, £805, Lisburn producer Aberdeen Angus 420kg, £830, Aberdeen Angus 440kg, £815, Crossgar producer Belgian Blue 430kg, £820 and Saintfield producer Hereford 510kg, £800. BULLOCKS Sold to a top of £1,290 for 630kg Hereford. SUCKLED CALVES: Sold to a top of £760 for Limousin bull calf and £690 for Limousin heifer calf. Dropped calves sold to a top of £365 for Belgian Blue bull calf and £175 for Aberdeen Angus heifer calf. Weanlings sold to a top of £500 for Aberdeen Angus bull calf and £490 for Aberdeen Angus heifer calf. Cows with calves sold to a top of £1,120 for Shorthorn beef with Shorthorn beef heifer calf at foot.